Motorcycle Diaries by Brazilian director Walter Salles not only popularized the travels of a young Ernesto ‘Che’ Guevara and friend Alberto Granado through South America but also an enduring friendship. El Che confía en mí (Che trusted me) details this friendship before, during and after the legendary trip, and was launched by the Abril publishing house on Monday at the ongoing 19 International Book Fair in Havana. 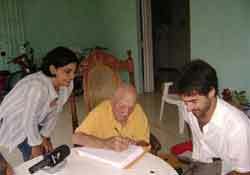 Written by Rosa María Fernández Sofía, the book is based on a series of interviews the longtime Cuban television and newspaper reported conducted with Alberto Granada. How did the project to write El Che confía en mí come about? “I was interested in writing something about Che’s penchant for literature and his background in philosophy after I heard the poems of a young Ernesto Guevara put to music and sung by Ivette Letusé. “I approached the Che Research Center with the idea and immediately received their enthusiastic support. I decided to carry out a series of interviews beginning with Alberto Granado who immediately captivated me. Is the book an interview with Granado about his relationship with Che or is it more like an autobiography of Alberto? “It is a book based on the spirit of humbleness and friendship, of selfless surrender to one’s fellow human beings. Both Granado’s and Guevara’s life were based on this idea. “The story follows the friendship shared between the two friends from when Ernesto was 14-years-old and Alberto was in his 20s, outlining all the shared dreams and days, their great adventure through South America and what happened after they went their separate ways following their travels. When we are in the presence of an extraordinary person, we invariably become trapped by their personality. What was it like to be with Alberto Granado? Why did you dedicate El Che confía en mí to the new generations? “Because every day it becomes harder and harder for young people to meet people of the historical stature of Ernesto and Alberto, and their only way of getting to know them is through what is written by and about them. I have two young children Fidel Alejandro and María Carla; this book is for them and everyone else who has the responsibility of continuing the work of the Revolution.